In an account-based world, you typically have 8-10 buyers on most any software-buying committee. You really should be thinking about their personas as part of that fit modeling. Join Terminus's CRO, Todd McCormick for a 3-step, quick-and-dirty account-based strategy that uses Intent data to prioritize and engage accounts. Sales wants more leads. But that doesn’t mean they will settle for just any leads. They want good-fit ones that will close quickly. Despite offering a winning product, Mendix found itself struggling to deliver high-quality leads to its sales team and close new deals in a reasonable amount of time. With a protracted MQL-to-Opp conversion rate, Mendix knew they had to do something to either improve the quality of the leads being passed to sales, or increase efficiencies throughout the process, or both. Watch Anh Ly, Marketing Systems Admin at Mendix, and DeAnn Poe, VP of Marketing at DiscoverOrg, discuss how Mendix was able to deliver more qualified leads to the sales team while also reducing prospect research time and enabling more informed follow-up. The end result: improving their MQL to Opportunity conversion by 14 times! It’s just math: If you don’t set enough meetings with the right people, you’ll never meet your sales goals. In this video, Chief Door Opener Caryn Kopp shows how to knock on the right door and start off on the right foot: Find the right target, nail the message, be ready to address objections, find the Door Opener, execute well, and make time for follow-up. How GDPR-compliant survey-based research presents a golden opportunity for account-based marketing (ABM) success. GDPR compliance has added a new layer of legal concern for marketers. But far from limiting it, GDPR compliance has created a truly golden opportunity for successful survey-based market research. Fuels an entire quarter’s worth of content strategy. Join Campaign Stars CEO & founder Henry Bruckstein and DiscoverOrg Director of Partnerships Krystan Resch for this ABM and GDPR Bootcamp! The #1 factor in a buying decision is timing. If the timing isn’t right, no amount of sales tactics will produce a sale. “Scoops,” or buying signals, are company events that indicate a pain point and often predict purchase behavior. In this new video, we’ll show how to time sales outreach using a specific Scoop - leadership changes - which has a high correlation to buying behavior. Unless you enjoy cold sales calls at 5AM, you know location is important in B2B sales. But did you know how location data boosts efficiency in so many other areas of sales? Accurate location data can help you map territories fairly, make on-site visits more effective, time your cold-call, boost ROI of direct mail, and increase event attendance. WatchChris Scheppler, CEO of CloudNerd, to learn five practical tips to maximize your prospecting efforts. He will demonstrate how to optimize your CRM and Sales Intelligence integrations to get the right messages to the right people at the right time. DATA IMPACTS ALL ASPECTS OF SALES AND MARKETING EFFORTS. DOES YOUR DATA RISE TO THE CHALLENGE? Watch DiscoverOrg's Director of Partnerships Krystan Resch, and guests from Skaled, Heinz Marketing, and The Bridge Group, as they review the survey and share what they think sales and marketing teams need to consider when evaluating a data provider for revenue growth. Org charts are an invaluable tool for sales professionals to navigate business relationships in target accounts. In this video, our Director of Partnerships, Krystan Resch offers 5 ways to use the org chart to uncover cross-sell opportunities, sphere of influence, multiple stakeholders, group email tips, and smart event follow-up. DiscoverOrg partnered with best-selling sales author Jill Konrath to interview Dana Huppert, Legal Operations Director for Synchronoss Technologies, to get an insider’s look at the goals and pain points of this powerful, behind-the-scenes buyer persona. Sales leader Jill Konrath has some pointed questions about the buying process for HR leaders, so she interviewed L. David Kingsley, Chief People Officer at Vlocity (formerly Head of Global People & Places at MuleSoft, and Head of Global Strategy at Salesforce). How do today’s marketing leaders evaluation and make purchase decisions? Sales leader Jill Konrath has some tough questions for CMOs, so she interviewed Heidi Bullock, Chief Marketing Officer at Engage.io. DiscoverOrg, the leading B2B intelligence provider, is transforming the way organizations discover, engage and acquire target buyers and hires by significantly expanding the number and type of data points delivered through its platform. New data points include visual parent-subsidiary relationships; mobile numbers and personal email addresses; in-depth work and education profiles; and investor and funding insights. +Hone in on best-fit prospects and talent across 100+ data points using any channel integrated directly into your workflow. +Build a plan for how to break into new divisions and departments with in existing customers. Your email deliverability is lower than you think. 90% email deliverability with a 10% bounce rate does not equal 90% deliverability. Watch the CEO, Brad Owen of Neverbounce walk through different email responses, demonstrate how to calculate the REAL bounce rate - and how to find a level you and your Marketing Automation System - can live with. Fortune 500 companies trust Deal IQ to negotiate significant savings on technology contracts. But when it came to targeting and seizing its own business opportunities, Deal IQ had hit a roadblock. Because of Deal IQ's unique solution, the ability to target potential new accounts at the right time - just as they prepare to acquire new technology or close a new deal - was absolutely crucial to success. And the need to engage high level stakeholders - the true decision makers at these accounts - meant Deal IQ needed reliable, accurate contact data, and organization charts. Join DiscoverOrg's VP of Customer Success, Andrew Brewer, and QualifiedMeetings CEO & Co-founder, Matt Wheeler, as they discuss key areas for achieving high velocity sales. Learn why accurate and actionable intelligence is key to identifying prospects, setting more meetings, and closing more business. The 'secret sauce' is not only having access to the right data, but knowing how to use it. QualifiedMeetings shares how they achieved High Velocity status by deploying an outbound strategy reliant on accurate and actionable data from DiscoverOrg. Do your SDRs have the right skills to crush their quotas quarter over quarter? Good recruiters know how to find the true decision makers at their target accounts. They know how to navigate within organizations to expand their reach, pick up on signals that companies might be in need of their services, and find a "purple squirrel." Great recruiters do it all at scale with data that drives revenue growth. Do you know the factors and prospect behaviors that indicate a true sales opportunity? How do you determine which opportunities belong in your sales funnel and which ones should be disqualified? Further, have you ever wondered what specific buyer behavior triggers deals to progress from stage to stage in your funnel? Do you feel like you have good visibility into the current status of your target accounts? Can you easily pinpoint which accounts and contacts sales should call next or which target accounts are not engaged and need to be added to a marketing campaign? 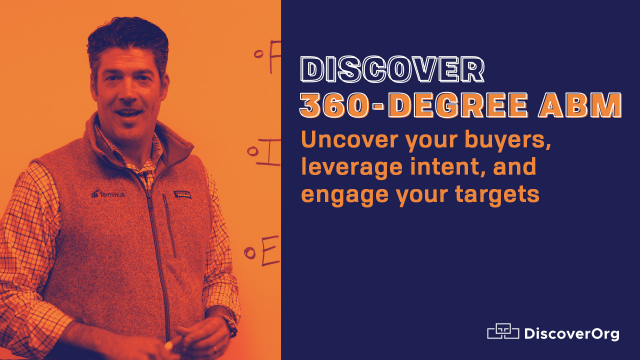 Watch this webinar to learn how to build a 360-degree view of your target accounts that includes firmographic, intent, and engagement insights. Prioritize accounts for marketing and sales programs. Identify segments of accounts for highly personalized campaigns. Ensure you are engaging the best contacts. Increase account engagement, opportunity creation, and pipeline velocity. Measure the success of your marketing and sales programs. DiscoverOrg is the leading global sales and marketing intelligence tool used by over 4,000 of the world’s fastest growing companies. Our award-winning solutions provide a stream of accurate and actionable company, contact, and contextual buying intelligence that can be used to find, connect with, and sell to target buyers more effectively – all integrated into the leading CRM, Sales Engagement, and Marketing Automation Tools on the market. Data is gathered and updated through DiscoverOrg’s proprietary combination of technology, tools and integrations, and then verified by an in-house research team – resulting in the highest guaranteed level of accuracy available across B2B sales and marketing data providers.